One of the effects of the economic struggles within F1 of late has been that the subject of drivers' salaries crops up more frequently. With other members of the teams being laid off or asked to accept less money, it seems unfair that the highest earners, the star drivers, should still be on obscenely inflated salaries. GrandPrix dot com currently has an article by the Mole on just this subject and his preferred solution is a salary cap of about $10 million. This sounds a simple and effective answer to the problem and I admit I have often thought it the appropriate one in the case of the captains of industry and commerce, those vaunted potentates who, too often, appear to be paid vast sums of money for leading their charges into bankruptcy. But I do think that the case of the F1 driver is slightly different. For a start, there is the matter of danger to be considered. While the chairman of the board risks little more than the occasional paper cut from handling too many stock and debenture issues, the racing driver is in much more danger of losing his life or suffering severe injury as he pursues his craft. Yet this is much less true than it once was and it has been many years since a F1 driver was killed in an accident. It might even be said that the danger factor is a canard, since salaries have increased as safety has improved. Certainly, there has never been a time when F1 drivers have been paid danger money in the same way as offshore oil drillers are. The true force behind the increase in driver salaries has been the need for teams to employ the best drivers available. 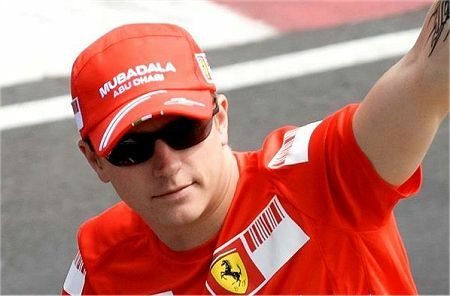 Ferrari were prepared to pay Kimi Raikkonen his supposed astronomically extravagant wages because, at the time, he was regarded as the fastest of them all. The assumption is that the highest salaries will buy the best drivers and this is true to the extent that any driver must be influenced in his career decisions by the amounts being offered. Yet money is not the only criterion that a driver must consider. The example of Jenson Button must surely indicate that drivers would do well to look at the potential for success in any prospective team; to be paid multi-millions is probably insufficient compensation for being denied the possibility of being crowned champion one day. There is, too, the famous instance of Ayrton Senna once offering to drive for Frank Williams for free that would give the lie to the idea of money being the be-all and end-all. The fact that Senna later claimed that it was not a serious offer probably has much more to do with a realization that he had let the cat out of the bag, rather than an attempt to set the record straight. If the best driver of his day is prepared to drive for nothing, how much does one pay the fresh-faced young rookie just arrived from GP2? Formula One teams are designed to compete and this extends to their choice of drivers. It is this that has led to the escalation in driver salaries and yet it seems to be based on the erroneous assumption that money can buy anyone. Particularly in the case of such ambition-driven characters as make it all the way to F1, the truth is that any and all of them would drive for much less if they could be sure of receiving a competitive car; it is the need to be the best that is their motivation and money can only ever be frosting on the cake of their race results. The problem with salary capping would not be with the motivation of the drivers, therefore. I am quite certain that each of them would continue as though nothing had changed - as the Mole points out, $10 million annually is more than sufficient to ensure an easy life after just a few working years. No, the change would be more in the position of team owners. No longer would there be a need to balance team budgets against the need for the best driver possible; with all drivers being paid about the same (apart from the new ones), the team is left with the only possible inducement being the excellence of its cars. Suddenly the power would shift from the owners to the drivers and those few pilots regarded as the stars could pick and choose according to their estimates of each team's potential. That may sound like a welcome adjustment to the present situation but it would actually worsen a problem that F1 already has - that the best drivers get the best cars and so ensure that the list of winners is disappointingly short. If Sir Jackie Stewart is right and there are only, at most, two supremely gifted drivers in each generation, we could have a return to the Schumacher years with each race becoming boringly predictable and a resultant destruction of hope amongst the also-rans. It seems to me that a better answer would be to allow the marketplace to decide such issues as drivers' salaries. It may be that none of the highly-paid drivers would voluntarily take a pay cut but I know that, if I were in their situation, I would readily suggest such a measure to my employers if it increased the chances of the team's economic survival. Those insisting upon their stated reward according to contract might well find themselves without a drive if the team is forced to withdraw from the sport. There is no doubt that driver salaries will decrease in the years to come; even without an economic crisis, it has become apparent that a ceiling has been reached and that money currently spent on drivers could be better used in the improvement of the cars. It has always been true that winning requires both a good driver and a good car but that is more so now than ever before. In 2008 Fernando Alonso demonstrated just how much difference a great driver can make to an average car - it was only as the car improved towards the end of the year that he was able to put a couple of wins on the board. Alonso himself claims that he is worth a magic six tenths of a second in lap times; yet the engineers and designers could as easily make the same assertion. If the drivers' values are reduced to a common maximum, they become like another component that can be switched in or out at will, just as Sir Frank has maintained all along. It might be more reality than the fans could stomach, to see their heroes become an expendable commodity. Even if it is true that the difference between F1 drivers is so tiny as to be unimportant, the sport needs to retain its belief in the superiority of some over others. Salaries help to bolster that belief (or we would not be so interested in how much Raikkonen, Alonso and Hamilton are paid) and they should continue to reflect the reputation of each driver. Fifty million is obviously far more than any driver is worth. Yet ten million, whilst more acceptable in the real world, is too arbitrary a figure to allow for our perceptions of abilities and talents. Let reality and the market decide. I don't see a salary cap ever happening. The FIA cannot make it happen. It cold only happen if all the teams agreed. As soon as one of the top teams found themselves to be without a star driver they would break the cap. Perception is all in F1. Imagine a situation where Kimi walked out on Ferrari and Massa was struggling. Would Ferrari risk going into another season with Massa and A N Other respecting the salary cap or are they going to entice Hamilton or Alonso to leave their current teams for substantially more money? I don't think for a second that Ferrari are the only team who would pay more to guarantee having an ace in the car. Imagine that a team chose to honour the cap and the next season produced a car that was consistently close to winning but never quite made it. All they would have thrown at them is that if they had hired a top driver they could have won championships. Whether that was true or not that would be the common perception. In the end teams will only pay what they feel they can afford and will refuse to pay more than that. They also have to consider the long term effects. Whenever this subject comes up I am reminded of Ron Dennis's comments on how the money he spent on Senna could have be spent making the car faster. Then when Senna choose to leave he would have a faster car rather than having invested in a driver who left as soon as the grass was greener elsewhere. Let's not forget the fact that sponsors are always ready to toss in extra $ for the right driver. I think who or how good a team's driver is, probably doesn't make a great deal of difference anymore. They all have lightening reflexes and none of them can show how daring they are for fear of being penalized. There is not a great deal of risk left. Each driver will take every $ they can get their hands on. There isn't a driver among the whole lot who is patriotic toward their country or team when dollars are the issue. I think that if the driver's salary comes out of the whole team budget we will have a better view as to the driver's worth as opposed to money spent elsewhere. I'm sure, once an equation is formed to represent the variable value of any given driver in relation to the whole package, their salary cap will be defined. I still haven't seen a workable package of budget enforcement vis-a-vis the teams. Are they going to stop looking for sponsors once they meet a certain sum of money? Steven: I agree that a cap on salaries is very unlikely ever to be instituted - in fact, I doubt that the FIA has the power to introduce such a measure. As you say, any attempt to regulate the matter by the teams would be certain to be broken as soon as a rich team felt they could break through by employing a better driver. But the suggestion has been made and my post is really an attempt at an argument against the idea so that it can be forgotten and more workable solutions found. Like you, I believe that the market will always curb excesses - the teams will never pay more than they can afford. It may be that a reconsideration of the value of the driver as opposed to the benefit of research and development is necessary, however. Honda's apparently excessive spending in 2008 might have looked a bit different had the drivers been paid a little less, for instance. Don: Very true, although the economic climate may reduce the amount sponsors are willing to put into a driver's wage packet. Once again, it is the best-known drivers who get the lion's share of such extras, however, very few sponsors being prepared to take a chance on an unproven rookie. The Mole suggests that personal sponsorship money be not taken into account in his proposed earnings cap and this could end up as a loophole to exaggerate the gap between the stars and the hopefuls even further.